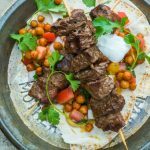 Tender beef kebabs and colorful grilled cherry tomatoes make a delicious and fun weeknight dinner. It's a low carb, and keto diet friendly dish loaded with protein. Make the marinade by stirring the first seven ingredients in a medium bowl. Pour a bit of the marinade into another bowl, then toss it with the tomatoes. Add the beef to the remaining marinade and let it sit at room temperature for about 15 minutes. Thread the meat and tomatoes onto separate skewers and sprinkle with salt and pepper. Grill the beef over medium-high heat, turning several times, for 9 to 12 minutes. Grill the tomatoes until they're heated through and the skin is puckered, about 1 minute per side. To serve, spread warmed hummus on a platter and lay the skewers on top. Garnish with a sprinkling of cilantro.